Every investor not living under a rock knows Warren Buffett, Chairman and CEO of Berkshire Hathaway Inc. (NYSE: BRK-A)(NYSE: BRK-B), but they might not be as familiar with Charlie Munger, Buffett’s business partner and Vice-Chairman of Berkshire Hathaway. Munger is Buffett’s right-hand man, and has played an important role at Berkshire Hathaway for decades. Together, these two legendary investors built the firm into the investment conglomerate it is today. Investors can learn a great deal from the wisdom Munger has gained over many years at the helm of Berkshire Hathaway. Here we take a look at some of his best quotes. Munger’s investment performance — both before and during his tenure at Berkshire Hathaway — is nothing short of spectacular. 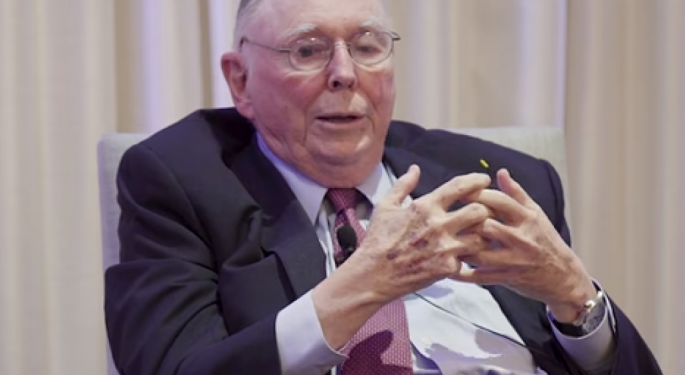 Munger actually managed his own investment partnership before joining Buffett at Berkshire Hathaway, during which he managed annual returns of 19.8 percent from 1962 to 1975, compared to just 5 percent annually for the Dow Jones Industrial Average over the same period. Often, the stock market irrationally discounts companies based on short-term factors, such as geopolitical events, rising interest rates and other macro-economic factors. Buffett and Munger try to buy these undervalued stocks when the market does not appreciate their long-term potential. Great businesses, according to Munger, are those that have durable competitive advantages, and highly profitable business models. Munger particularly likes businesses that do not require a great deal of reinvestment in order to grow. In addition, investors should focus on investments that are not overly complicated. Sometimes, the best long-term businesses operate in industries that do not experience rapid change. In addition, investors should carefully consider a company’s management team. Even great businesses can be brought to ruin by incompetent managers. Investors should favor companies that do not require geniuses in the executive suite to be run effectively. Now that investors have selected great businesses with strong management teams, the next best thing they can do is be patient. Investors tend to react impulsively. With the often-volatile swings of the stock market, it can be easy for investors to think they always need to respond to daily events by trading in and out of their positions. This is a huge mistake, and is one of the biggest reasons why many investors earn weak returns over time. Trading frequently generates trading commissions, and in some cases, tax liability. There is simply no way any investor can know the perfect time to buy and sell stocks. Munger’s apathy toward diversification runs contrary to a cornerstone principle of many investors. But given his remarkable investment performance at his own partnership, and then at Berkshire, it is hard to argue with his methodology. The takeaway for investors is that it is entirely possible to do well in the stock market, and you don’t have to be an investment banker or possess an MBA. Investors can generate strong returns over time, simply by following a few simple rules in the investment selection process. If investors buy high-quality businesses trading for less than their intrinsic value, with strong management teams, and are patient to hold for long periods of time, their performance can measurably improve.